You love to sew. In fact, few things make you happier than going into your sewing room, shutting the door, and spending a few peaceful hours working on your latest sewing project. Sure, you like having something to show for your time and effort. (Like a new duvet cover for your bed. Or a shirt made from a pattern you loved at first sight. 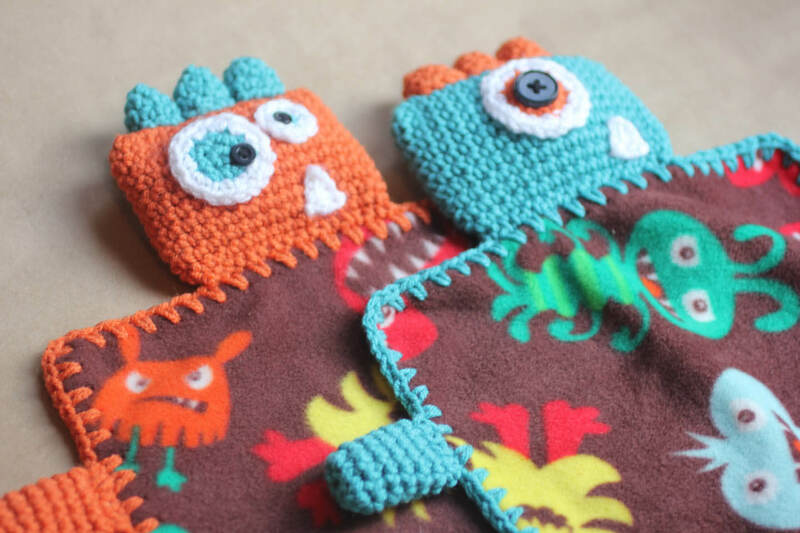 Or some quilted toys for your grandkids.) But you also enjoy the act of sewing itself, and would probably do it even if you had nothing to “show for it” in the end. Now imagine getting paid to do something you love that much. Like most who take up sewing as a hobby, you do it because you enjoy it. Using your sewing skills to make money might never have crossed your mind. 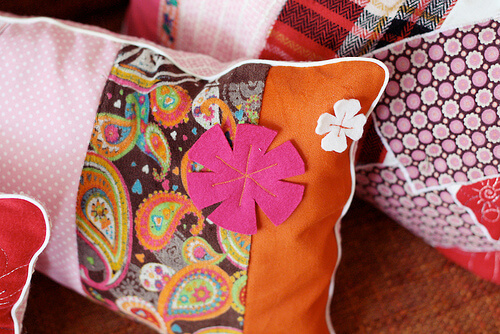 Yes, you can make money with your sewing skills. And you don’t have to be an expert sewer with years of experience to do it. Sewers at any skill level, even novices relatively new to the craft, can turn their sewing skills into cash. And as your skills improve, your profits will grow right along with them. Does making money and having fun at the same time sound like a pipe dream? Well, lots of people are doing it. Some sewers use their skills to make a little extra spending money. And some sewers turn their hobby into full-time, work-at-home businesses. That’s right. They make a full time income doing something they’d happily do for free. 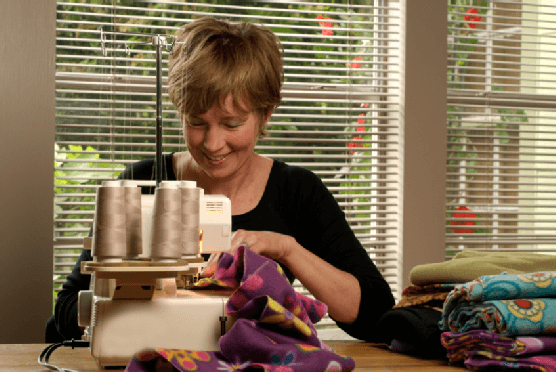 In this article, you will learn about five different sewing businesses you can start right now, whether you’re a newbie sewer, or a sewing master. After that, you’ll find tips on how you can get your sewing business up and running…and turning a profit. When you have a sewing business, no matter how large or small, your success depends on your ability to attract customers. This might sound daunting, but it’s actually easier than you might think. And, in this article, you’ll find a few simple tricks, most of them free, that will help you let potential customers know about your goods and services. 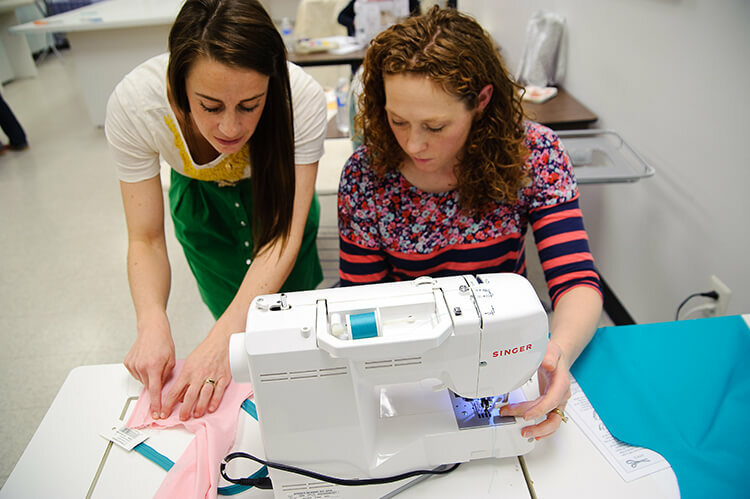 Are you ready to turn your sewing skills into cash? Well, keep reading to find out how you can join the ranks of sewers and crafters who have already done just that. We’ve already talked about the biggest reason sewing is a great way to make money. You get to earn extra cash doing something fun that you already do for free. But there are some other pretty good reasons for starting your own sewing business. And here are just a few of them. You Get To Do It At Home. Have you been thinking of getting a part time job to earn some extra cash? Well, working outside of the home comes with its own expenses. First, there’s paying for the gas you need to get to work. And, depending on how far away your job is from your home, you could end up spending a good chunk of your paycheck on transportation costs. Do you have kids? Then paying for someone to watch them while you’re at work might be another expense. There could be other expenses to, like buying new work clothes and paying for lunches. Instead of getting a part-time job outside of your home, your “part-time job” could be sewing for profit. Not only do you not have to deal with those extra expenses, you can work in the comfort of your own home. In fact, if you want to work in your pajamas while listening to your favorite dance music, you can. Your Hours Are As Flexible as You Need Them to Be. When you start your own sewing business, you’re the boss. This means you can work whenever you want, for however long you want. You Can Start Small and Build. Do you already have a full-time or part-time job? Well, that doesn’t have to stop you from starting a small sewing business. You can make money sewing even if you only have a few hours a week to spare. Compared to some other businesses, starting your own sewing business is relatively easy. You don’t have to drop everything else in order to learn the ropes, or drum up business. In fact, you’ll be surprised by how in-demand your sewing skills turn out to be. You might not know all there is to know about the “business” side of having a sewing business just yet. And you don’t have to. Just start with the basics. And, as your knowledge grows, you can grow your business. 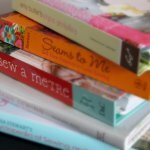 It might not seem possible right now but, eventually, your sewing business could become your full-time job. Or maybe you want to keep things small and simple. Many sewers are happy with the money they earn spending just a few hours per week on their sewing business. The thought of starting a sewing business might seem overwhelming to your right now. But thinking about all you have to gain makes it easier to take the plunge. Okay, you’re ready to start making money from your sewing. Now let’s take a look at the ways you can go about actually doing it. The great thing about making money with your sewing is that there are so many ways to go about doing it. Your experience level. 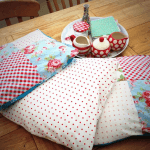 Are you a relative newbie, or do you have years of sewing experience? Your experience level will help decide which sewing business will fit you best. Your personality. Are you an introvert or an extrovert? While someone who’s outgoing might be drawn to one type of sewing business, someone who’s a bit shy might be more comfortable with another. The types of sewing projects you enjoy. After all, the whole point of making money sewing is being able to earn some cash while doing something you already love to do. So you should choose a sewing business that allows you to do the types of sewing projects you most enjoy. 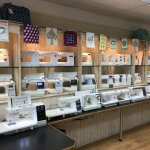 Here are five sewing businesses to choose from. As you read each option, think about what would be involved in running that business, and how you feel about doing those things. 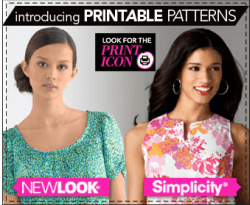 This will help you pinpoint the sewing business that really appeals to you. As fun as sewing can be, it also has its practical side. When a piece of clothing gets damaged, you can either repair the damage or buy a replacement. And, as any sewer knows, repairing or altering clothes is always less expensive than buying something new. While repairing and altering clothes is a great way to save money, you can also use those skills to earn some cash? Many people have garments they love too much to throw away. But they can’t actually wear those items because they have rips, tears, broken zippers, or missing buttons. And not everyone has the skills needed to repairs damaged clothes. Some of those people would be happy to pay someone—like you—to fix a favorite jacket, dress, or pair of jeans. And don’t forget about offering alteration services. Some of your potential customers are people who have a hard time finding clothes that fit them correctly. After buying clothes from a retail store, they’ll gladly pay you to make the tweaks necessary to make those new clothes fit them better. 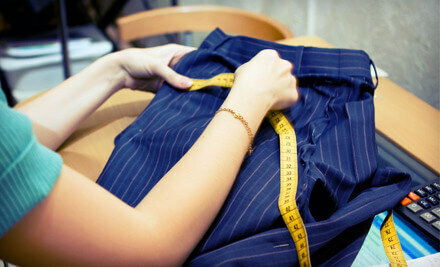 People who have lost (or are still losing) weight could also use your alteration services. Not everyone wants to run out and buy a whole new wardrobe to fit their new bodies. Instead, they’d rather pay someone to adjust the clothes they already have to fit their new size. Do you love to make clothes? Can you make garments to fit people of any shape, size or body type? If so, you can make money making garments for others. Some people would love to have the latest designer fashions, but can’t afford to pay the latest designer prices. If you put the word out that you can make “designer knock-offs” for a fraction of the price, you’ll have potential customers beating down your door. You can also make money making attire for special occasions. If you can make Halloween costumes, you can turn quite a profit in the weeks leading up to October 31st. And if you can make beautiful and affordable formal wear, you can have the cash pouring in during prom season. And don’t forget weddings. There are sewers who make a full-time living making dresses for brides, their mothers, bridesmaids, flower girls, or anyone else who needs an outfit for the occasion. You like making clothes okay. But your real passion is making home décor items, like curtains, pillow cases, table cloths, and duvet covers. If this describes you, you can build a sewing business around making home décor items for other people. When you go shopping for things like drapes, throw pillows, and quilts, it can be hard to find exactly what you want in a retail store. This is especially true if you’re looking for something not only in a particular style, but that also has the right color or pattern. Sometimes, the only solution is to buy some fabric that suits your needs, and make the item yourself. But if someone doesn’t have the skills to make their own curtains or pillow cases, they might pay you to make those items for them. The great thing about building your business around making home décor items is that any order you get has the potential to grow. For example, if someone wants you to make a duvet cover for them, ask if they’d also like matching curtains and pillow cases. You don’t have to know how to make every home décor item imaginable in order to have this type of sewing business. Instead, you can specialize. For example, you can focus on making items for a specific room, like the bedroom, or the kitchen. Or you can specialize in making just one thing, like curtains or duvet covers. Many people would love to learn to sew, but one thing or another seems to stand in the way. Maybe they can’t afford classes. Or, just as likely, they can’t rearrange their schedules to attend a class that meets at a set time once or twice a week. Of course sewing books, magazines and websites can help them learn to so. But some people prefer to learn from a living, breathing person who can teach them the basics, quickly correct their mistakes, and answer their questions in real time. People like this would gladly pay a small, hourly fee for one-on-one sessions with a sewing tutor. And that sewing tutor could be you. If you don’t think you know enough to be a sewing tutor, there’s good news. You don’t have to be an expert sewer with years of experience in order to teach others how to sew. In fact, if you have a solid grasp of the most basic sewing skills, you have plenty to teach someone who knows little or nothing about sewing. If a student has their own sewing machine, you could offer to go to their home to give them lessons. This way, they don’t have to worry about childcare. Other great places to give one-on-one sewing lessons include public parks, libraries and fabric shops. Or, if you’d prefer to give lessons in the comfort of your own home, you can do that too. Another way to make money teaching others to sew is by throwing “sewing parties.” Guests who attend these parties (which will last about 2 or 3 hours) will pay you a small fee. In exchange, you will walk them, step-by-step, through the creation of a single, simple sewing project. To make things convenient for your students, you can provide the needed materials, and work the cost of those materials into the initial fee. If you throw sewing parties for children over the weekend, parents will gladly pay not just to have their children learn to so, but to also get a few hours of free time. Whether you’re a sewer, quilter, embroiderer, or some other type of crafter, you probably have the skills to make at least one thing other people would buy. And, believe it or not, you can build a profitable craft business around being able to make one or two things really well. One problem avid crafters have is that, after a while, their homes begin to overflow with their completed crafting projects. Even giving most of what they make to friends and family members doesn’t always help. The solution? Sell some of those crafts you’ve made. Not only will you reclaim living space, but you’ll turn a profit at the same time. So, how can you go about selling your crafts? One option is to use an online marketplace, like Etsy. These sites make it easy to set up your own virtual store. Getting your first few sales might be tough. But once you have some happy customers spreading the word about your products, your online business will start to flourish. Etsy can be a gold mine if you do it right. If you want to learn how to properly market and sell your items on Etsy go have a look at this course. If you don’t want to sell online, there are plenty of alternatives. For example, check out the consignment shops in your area. These shops will sell your crafts for you, and then give you a cut of the profits. If you make quilts, just letting your friends and acquaintances know you’re willing to sell some of them can help kick start your sewing business. 6. Offer a Sewing Machine Repair Service. 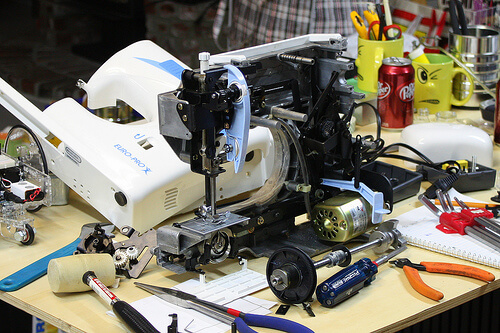 One thing that all sewers need from time to time is someone to fix their sewing machines. Taking their machines to the shop for a small repair usually costs a lot so people would rather hire someone like you to do it for them at a better price. Learning how to repair sewing machines is a great skill to have because not only can you repair other people’s sewing machines you can also repair your own machines and save yourself a lot of money in the process. My friend Tony Asef is a veteran sewing machine repairmen and he can teach anyone how to fix sewing machines in just 30 days. His ebook cost only $39 and it will pay for itself ten times over soon. So which of these sewing businesses appeals to you most? Did one of them really grab hold of you? Or maybe you’re having a hard time choosing between two or three. Just make sure you choose a business that you’d actually enjoy running. It’s true that some of these businesses have the potential to be more profitable than others. But you want to be able to make money and enjoy yourself at the same time. If you enjoy your business, you’ll put more effort into it, and that will have an effect in your bottom line. So ask yourself what you really want to do. Would you enjoy giving sewing lessons? Do you think it would be fun to run an online store? Does the thought of making wedding dresses all of the time make your heart sing? Then that should be the basis of your sewing business. Making money is great, but making money doing something that doesn’t feel like “work” is even better. Okay, you’re sold. 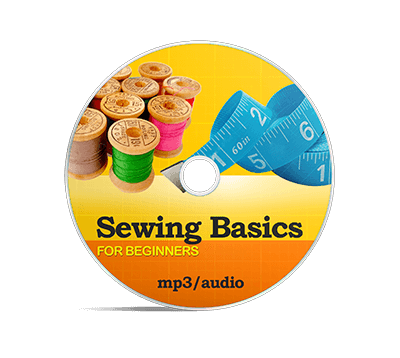 You want to start making money with your sewing. Many people hear the word “advertising” and instantly feel overwhelmed. They think marketing a business is a complicated process that costs a lot of money. But you’ll be surprised by how easy it is to advertise your sewing business. And many of the most effective marketing techniques won’t cost you a single penny. The minute you decide to make money from your sewing, start telling people about it. Tell your friends, family members, passing acquaintance…anyone you can think of. You just might know someone who wants new drapes, or would love to buy one of your quilts. Even if the person you tell doesn’t need to have a wedding dress or sewing lessons right now, they might know someone else who does. Many craft and fabric stores have bulletin boards where you can post flyers advertising your goods or services. You can also ask store owners if you can leave some flyers at the checkout counter. Many of them will actually say yes. Other places that might have bulletin boards you can use to advertise your business include dry cleaners, colleges, and grocery stores. If you want to sell your crafts, try getting them into local consignment shops. They’ll sell your crafts for you, and give you a cut of the profits. Consider setting up a booth at a local flea market. Many people go to flea markets specifically to buy handmade crafts like the ones you make. Many clothing and home décor boutiques sell goods made by local crafters. Contact some of the boutiques in your area, and see if they’d be interested in what you have to offer. 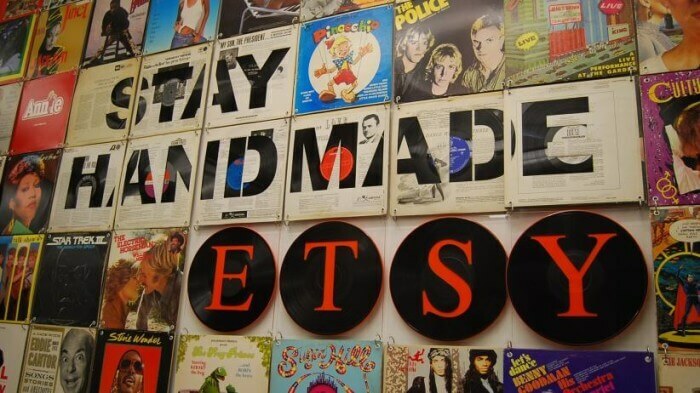 You’ve probably heard of Etsy, the most well-known “homemade marketplace” on the Internet. But there are plenty of others, like Shopify, Big Cartel, Zibbet and Indiemade. Before you settle on an online marketplace, carefully check out its terms and policies. You can also read reviews by crafters already selling goods on these sites. This will give you a sense of which sites might suit your needs, and which ones you should avoid. Even if you only intend to sew to earn a little extra cash, handing out business cards is a great way to spread the word about your goods and services. And services like Vistaprint will give you hundreds of business cards. Use your business cards to let people know what you do, how they can contact you, and where they can find your online store. Placing ads is a classic way to advertise your business. And you’re not limited to the local paper either. You know those free publications you see at the supermarket? Many will run your ad for a fraction of what a newspaper would charge. If you want to advertise your business for free, consider Craigslist. It’s a fast and affordable way to reach a lot of potential customers in your area. Have you been looking for a way to earn extra cash? Then look no further than your own sewing machine. If you can sew, you can make money, even if you are relatively new to the sewing craft. 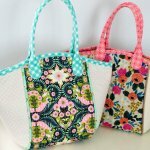 The great thing about starting your own sewing business is that you can start small and simple. Then, as you learn more about running your own business, and marketing your goods and services, you can grow your business and your profits. So what are you waiting for? Just pick the sewing business that appeals to you the most. And then decide how you want to get the word out. Before you know it, you’ll have your first paying customer. And then your second. And then your third. 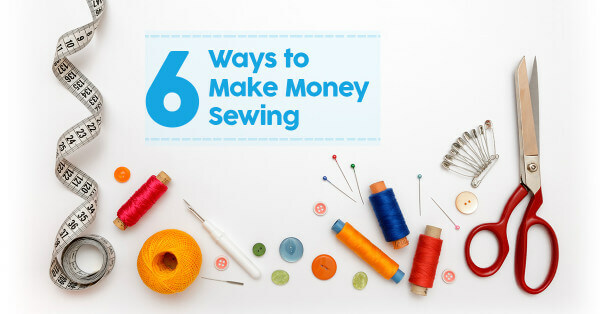 And, as simple as that, you’ll be making real money from your sewing. Here is another awesome Ebook that has helped lots of women make lots of money from selling their own crafts. The book does a great job at helping you decide which crafts to make for the most profit. Have a look at the course here..